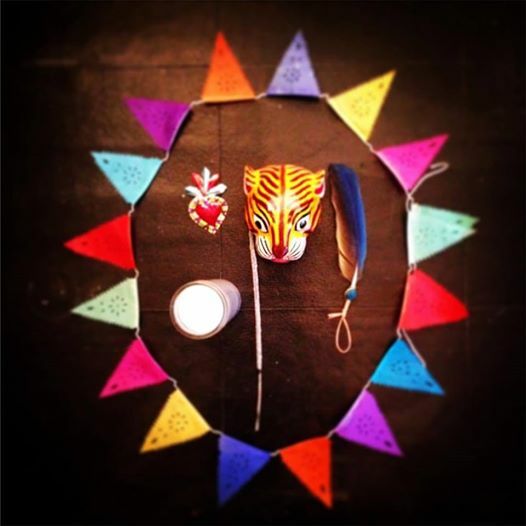 The Flying Cat: The Flying Cat Re-Opens! 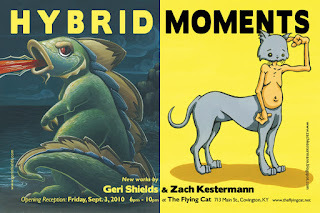 *Geri Shields, Codzilla, acrylic on board, 16"x20" *Zach Kestermann, Catmanduke, acrylic on board, 9"x12"
After being closed for much of the summer for renovations, The Flying Cat Boutique & Gallery re-opens it's door on September 3, 2010 to present Hybrid Moments, an exhibition by artists Geri Shields and Zach Kestermann. The Show will be on display from September 3, 2010 to September 30, 2010. An opening reception will be held on First Friday, September 3, from 6pm to 10pm. Light refreshments will be provided. The event is free and open to the public. 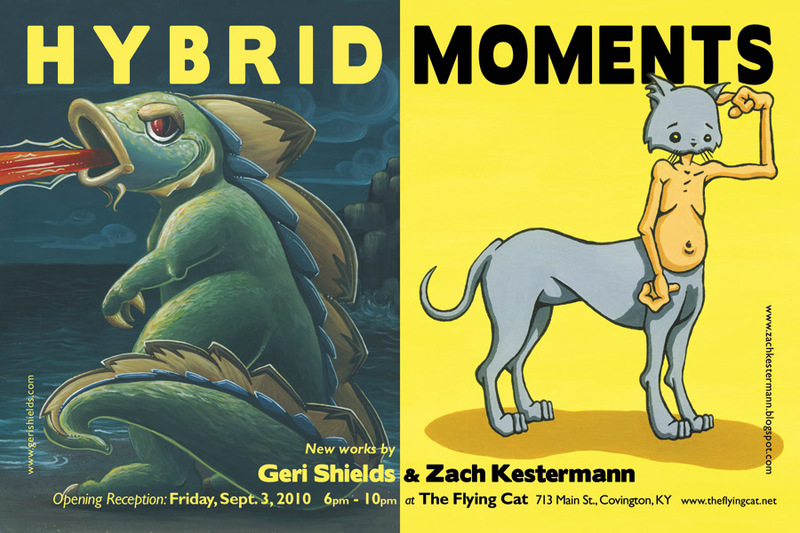 This exhibition showcases new paintings by Geri shields and Zach Kestermann. Both artists have combined features from various animal species, mythical beings, and a few tidbits of pop culture to create a diverse collection of hybrid creatures. Geri Shields creates textural paintings of light-hearted, quirky characters engaged in the ordinary tasks of being extraordinary. Her compositions remain uncluttered to emphasize the intimate narratives between beast and environment. She states, "I 'design' my paintings to tell the breadth of a story and the intricacies of relationships with minimal details and little distractions. I want the viewer to focus on the 'moment' captured, not the accessories." Zach Kestermann compares his pieces to a potato chip, "they are simple, clean, and crisp." Whether they are standing alone against a solid field of color, or precisely integrated into their habitat, his crossbreeds exude a confident humor. They are painted with a steady hand and a strategic use of color. The graphic nature of his approach gives a smooth, almost screen printed look to his paintings. Both artists graduated from the Art Academy of Cincinnati, Geri Shields in 2005 and Zach Kestermann in 2006. They reside in Cincinnati and have shown their artwork in galleries on both sides of the river and beyond. This is their second exhibition at The Flying Cat. The Flying Cat is a boutique and gallery located in Mainstrasse Village, in Covington, KY. For the past month, the store has been closed for renovations. We have reorganized and reimagined the overall look of the store. Our walls now exhibit a sophisticated new color palate and our shelves house wonderful new handmade goods available for purchase. Our grand re-opening festivities on September 3rd not only include our First Friday Gallery Event. We will also be offering tarot readings and henna. 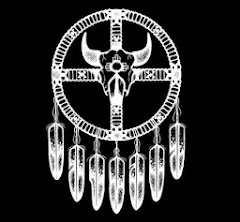 The Flying Cat sells and exhibits handcrafted work in all media by emerging artists, designers, and crafters. Our gallery exhibitions rotate every month. We are open First Fridays, 6-10pm and every Saturday, 12-5pm.